Police have arrested a man who was carrying a machete during a fight outside a Northampton school. The fight happened in Kingsland Gardens, Kingsthorpe, near the Good Shepherd Catholic Primary School at just after 3pm today. 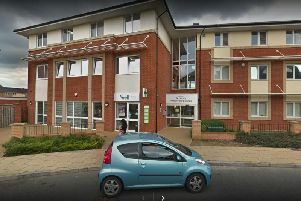 Northamptonshire Police said an argument broke out between a small group of men, one of whom was seen carrying a machete. As a result, paramedics were called and two men were taken to Northampton General Hospital, at least one suffering a head wound. It is believed none of the injuries were caused by the machete. Officers subsequently arrested a man on suspicion of affray and carrying an offensive weapon. The machete has since been recovered but police briefly asked teachers to keep pupils inside until they found the other men involved.